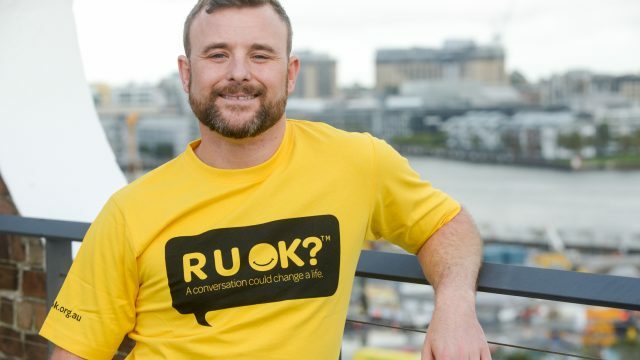 Craig Mack: Why every day is a good day to ask RU OK.
We sat down with Craig Mack, RUOK Day Ambassador, to talk about the pressures of social media, dealing with mental health in the workplace and how just three simple words could change a life. Hi Craig! You wear a lot of hats: You’re a social media and content strategist, LGBTQI advocate and blogger, model, influencer and speaker. You’re also a mental health advocate and an ambassador for RU OK Day, which is why you’re talking to us today. Most people have heard of RU OK and the day itself, but for those who haven’t, can you tell us a bit about the organisation? Absolutely! RU OK was started ten years ago by Gavin Larkin, after his father died by suicide. It was such a shock to his family and friends and no one saw it coming or really understood why he didn’t reach out for help. Gavin wanted to get people talking more openly, sharing their experiences, how they were feeling and breaking down the stigmas about mental health. He really wanted people to just talk about how life sometimes gets too much, and know that that’s ok… because no one really did before. R U OK? was partly created to remove the stigma and the fear and the shame, but also to spread awareness that mental health is important and we should all be talking to each other more. And what about you? How did you become involved? It’s my 2nd year as an Ambassador for RU OK Day and part of our role is spreading the message about why watching out for friends and family is important, to help people understand that, at some point in our lives, tough times and/or mental health issues affect all of us. It’s about educating people in how to approach challenging conversations. I contacted the RU OK? Team to get involved after a friend of a friend took his own life. They were the 9th person that I knew of in about 18 months who had died by suicide. I’ve managed the rollercoaster of depression and have had 3 experiences with suicide of my own, at 16, 24 and 36, and felt I had to do something. Wow. That many in just eighteen months? Unfortunately yes, rates of death by suicide are still too high. In 2017 there were 3,128 recorded deaths by suicide in Australia. 1 in 6 of us will experience depression at some point in our lives so it’s something that impacts all of us. Knowing of 9 people might sound like a lot, but the LGBTQI community is one most at risk of depression, anxiety and suicide. We need to turn that around somehow. You have re-published an amazing speech on your blog about your upbringing and how it got you to this point. Yeah, it was intense and interesting childhood, and it set me up for quite a wild ride. Growing up in a house of heroin addicts, drug dealers, hookers, police raids, domestic violence, and chaos was definitely far from the norm. It took a lot of work to get past it and I can sort of laugh and tell stories about it now. I’m great at dinner parties! Some of the experiences so unbelievable that you couldn’t make them up. It was incredibly raw and personal and honest. Do you ever get to the point where you feel like you’ve done all you can do and you just want to go and live your life and not have to keep talking about it? It’s taken me a long time to tell the whole story, it’s not one that I ever thought I would ever tell in full to be honest. When the eighth or ninth person died it was around the time of an RU OK Day campaign and it sort of triggered something in me. I felt I had a story to tell and I could sit back and watch it continue or I could do something to try and help. I was 41 when I signed on with R U OK? and shared my story for the first time. When people have told me how it has helped, or approach me to ask for help, I know it’s doing good. For me, that’s getting a bit of light from all of the darkness. Sometimes I’ll be talking and have a lightbulb moment of my own about something on my mind, so it helps me, too. Ok. So let’s talk about RU OK Day. The day may have passed but the organisation is there, encouraging conversations 365 days a year. So how do you go about it? Ask if someone is okay. There are a hundred different ways to ask but sometimes the simplest way is just that: RU OK? And then it’s about getting the person to open up. Listen. Take the time and don’t talk at them, really listen. Silence is beautiful. And early intervention is key. It could just be they’re having an off day or it could be that something bigger is going on and you caught it in time. But you don’t know unless you listen. Encourage further action. It might just be enough to offer suggestions for ways they can make themselves start to reconnect with the good vibes and reframe their thinking. There are little things I like to do like the “100 days of happiness”. I also have a smile jar at home and every time something good happens I put it in the jar- these things encourage you to just find happiness in the every day. But you may need to do more than that. If something is more urgent, if someone is in crisis then it’s about getting them to speak with their GP or another healthcare professional. Step Four is about checking in. Keep the conversation open. I had a friend years ago who would send me emoji’s and memes and we’d just go out for coffee every now and then and that was just her way of checking in to see how I was going and making sure I was getting better and not worse. It can take 3, 4, 5, 6 attempts until someone can answer it honestly. Because you may not be ready to answer it, you may not be comfortable or want to talk. You have to catch someone in the mood or at the right time. So it can take a lot to get someone to open up. Is that why people sometimes find it so difficult to ask RU OK? Or why don’t people ask enough? There are a whole lot of different reasons. There’s a lot of stigma, confusion and fear when it comes to mental health. But you might not know what signs to look out for and therefore just don’t notice them. One of RU OK’s messages this year has been on understanding signs and being able to recognise when someone isn’t okay, Signs are different for everyone, the only real universal sign is someone not being, or acting like themselves, consistently for a period of time. There’s a great video on the RU OK site all about signs and how to recognise them. Even when people do see signs a lot of us don’t know what to do or think we have to have the answer or be able to solve the problem. Some people think they have to take responsibility for their friend’s welfare too, and that’s a big job. Some days looking after just ourselves is enough of a challenge. None of these things are right though, because ultimately you’re not responsible for anyone else’s life, and you’re probably not a mental health worker – but what you are is a friend. As a friend you can listen and often that bit of support and care can be enough. You can ask questions, share ideas and encourage actions to help change the vibe, including encouraging seeking help from professionals and mental health organisations. It all starts with a conversation. We all go to such lengths these days to create sort of the perfect life on social media… do you think it’s harder now than it used to be to tell if something is up? We’re all so connected and yet perhaps more disconnected than ever before. Social media is such a double edged sword. After my third attempt It did a wonderful job of keeping me connected to the world at a time when I couldn’t face it and basically withdrew as much as I could, but it also showed me life going on without me – which was disconnecting and isolating. A few friends have spoken to me since and I was fascinated that they actually didn’t notice that I was never around, that my whole life was online- lots of selfies and Facebook and Insta activity. What they saw was me always posting stuff, so it looked like I was busy and loving life, even though I was anything but. I wouldn’t be a good social media nerd if I didn’t say that social media is easy to blame, especially for the warped idea that we need to be- and present as- perfect. But it’s actually human behaviour, and this expectation that we always present our best selves to the world, and never show vulnerability that’s been built up over centuries. It’s the ‘never let em see you bleed’ or ‘or don’t let guests in the house before you’ve dusted’ attitude. But do you think social media- the pressure to get likes and interaction- is putting added pressure on our mental health? The need for likes, attention and immediate validation can be damaging. No one should tie their self-worth to the click of a button. Bullying and trolling are also still far too common, and easy to do from behind a screen, and screen addiction is a growing issue – all of these things impact our happiness and satisfaction. These challenges are part of why Instagram launched a Wellbeing team earlier this year. Social media and the tech we have now is all really new when you think about it. Google is only 21, Facebook is around 14 and Instagram 8. As we’ve learned to use the tech I think we’ve learned some hard lessons about human behaviour – and what happens when the worst of it is amplified in ways it never has been before, the need for authenticity and critical thinking and what makes a meaningful connection. I think we’ve now gone through one generation who have seen how damaging it can be and we’ve gotten wiser. Younger people who have grown up with the internet and smart phones approach it slightly differently- and more consciously- these days. We’ve talked about the pressure online… what about at work? Can we be open about our mental health in the workplace? I think we’re more willing to speak out. If I look back the last ten years or so when I was 24 and I just really didn’t have it together, the attitude in the workplace then- from my boss- was just, “dude, you gotta get it together or just get out.” Now it’s changing, which is such a good thing. Bosses and organisations and businesses have systems in place to manage mental health but also there are external organisations, like SeventeenHundred who provide solutions to help companies make workplace mental health a priority and help employers and employees address and manage mental health within their organisations. How are companies making this change internally? I work for a massive advertising and creative group called WPP, which covers hundreds of creative, PR and Ad agencies across Australia and NZ, and thousands across the world. We introduced a Wellness program here in Australia. It was a huge investment that showed commitment and focuses for the business. Programs like EAP (Employee Assistance Program) were introduced, training on mindfulness, understanding how to use and understand our energy better, promotion of physical health, good nutrition and all the things that wholistically make up our health is part of the program. Work life and home life are now more connected than ever before because WE are more connected online and through our devices than ever before, so wellness programs, leadership training great organisations like SeventeenHundred, and having some focus on wellness are becoming more and more essential – and common. Does the conversation about RU OK have to be any different in the workplace? I don’t think there is much difference. The responsibility to act, for health and safety reasons, and the types of conversations or concerns may be different from one place and industry to another but the core need and approach is essentially the same. But it can be a slightly harder conversation to have or thing to admit because a lot of people still believe (and some workplace cultures expect) no perceived vulnerability. if you’re a manager or you’re running a business, there are some really great resources online- you can talk with SeventeenHundred about ways to make your organisation more understanding towards an employee who might be struggling. RU OK? also works with a number of industries and has some amazing resources tailored to the needs of different groups on the website. These resources have been developed in collaboration, with RU OK? and industry groups and peak bodies to address mental health concerns, including lawyers, Transport NSW, FIFO workers, rail workers and many more who are, in particular, struggling with their mental health. The key message is nice and simple really: EVERY day is a great day to have a conversation with a mate- or a colleague- maybe even one that can change a life, and we all have the power to be a friend, or ask for help when we need it. Craig’s blog, https://craigontoast.com/ is not only funny and insightful but it has a wealth of resources about RU OK Day and where to go to find mental health support if you or someone you know is struggling. You can also follow him on Instagram and Twitter. SeventeenHundred is an innovation-driven organisation that creates supportive relationships between companies and their employees. They have a wealth of resources on how to deal with mental health in the workplace and where you can go for help. Visit www.seventeenhundred.com.au or visit their page on the TBS Media Hub.